The fraud of man-made climate change was exposed from emails at the University of East Anglica. Global average temperatures have not warmed for over a decade. The United Nations Climate Accords in Copenhagen (Cop15) failed to result in worldwide agreements, yet the beat goes on. Climate change policies will continue to operate covertly at the local level to develop socially engineered and controlled communities. Many local officials are committing acts of treason. Local people like you have the power to stop them. 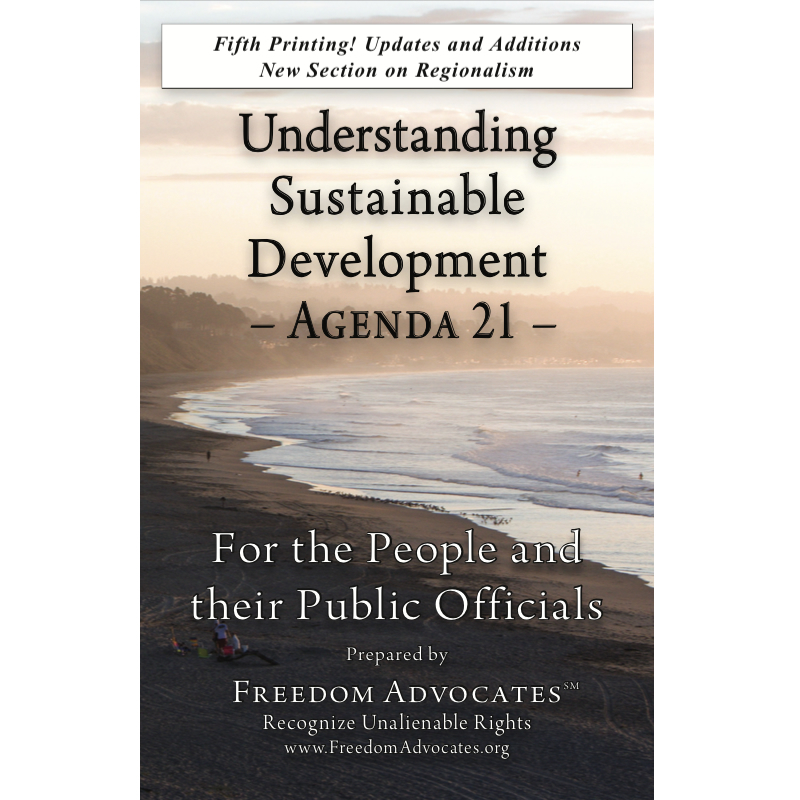 ICLEI* is an international council that corrupts government employees and local politics by infiltrating local governments world-wide in the name of “climate change.” ICLEI implements the global governance plan of the United Nations Agenda 21. Its objectives are to abolish private property and move us into controlled “human settlements” also known as Smart Growth cities. Its campaigns are executed by dangling grant money in front of dollar-desperate officials who trade our liberties away for an extra dime. Local governments and regional authorities making ICLEI directed policy changes usually have titles for their big money grabbing, tax sucking, anti-liberty ideas. Be aware of PlaNYC 2030, ACTION Pajaro Valley, PLANit Tulsa, Sustainable Atlanta, Vision Long Island and Greenprint Denver, just to name a mere few. ICLEI advocates a transformational government in accordance with the principles set out by the United Nations Declaration of Human Rights. This means that ICLEI negates the Declaration of Independence, violates the United States Constitution and the Constitutions of most states, and is also in violation of state criminal penal codes. ICLEI implementation is treasonous. We must hold our local elected officials accountable for allowing ICLEI into our local government! Elected representatives and government staff must be made aware of their transgression before criminal charges of treason can be brought against them. Is your town or county an ICLEI member? Take a small scanner and scan as you research. The city or county should provide a desk with an outlet nearby; if not ask to be set up so you can work effectively. After your initial viewing, scrutinize the documents away from the offices. You may find that you need more than just documents. For example, emails or correspondence which need time for compilation by the city/county clerk. This time a formal Public Records or FOIA request will be needed. Hand deliver it to the appropriate clerk or official. Make sure the clerk stamps the request at the desk while you wait. Make sure you retain a copy of this formal request from the clerk as complications can arise. You should receive the documents on an agreed upon date. Call or Fax to remind them that you will be there on the designated date. Will your public officials require notice of misprision of treason? <click to read sample notice letter. We welcome your ideas and participation. Please contact Freedom Advocates should you wish to discuss this in more detail. Click here for Dr. Stan Monteith radio interview with Jeannie Soderman on ICLEI – the history, structure and ramifications.